Tomatoes of all shapes, sizes and colors are piling up in my kitchen. The cherry types are particularly prolific at the moment. In browsing my rather large cookbook selection I recently stumbled upon a book I’ve had for 10+ years but have never really looked at. Keeping Food Fresh: Old World Techniques and Recipes from the Gardeners and Farmers of Terre Vivante. The book has a forward by famed farmer Eliot Coleman and covers preserving with oil, vinegar, alcohol, salt, sugar, by lactic fermentation and drying; in other words methods that don’t need much, if any, energy to prepare and none to store. It caught my attention this year for a variety of reasons: 1) I have a smaller freezer than I used to; 2) with all the earthquake perparedness talk I’m thinking more about preserves that don’t rely on electricity to stay edible; and 3) the crazy heat is inspiring more awareness around energy use a (and its link to our warming planet). 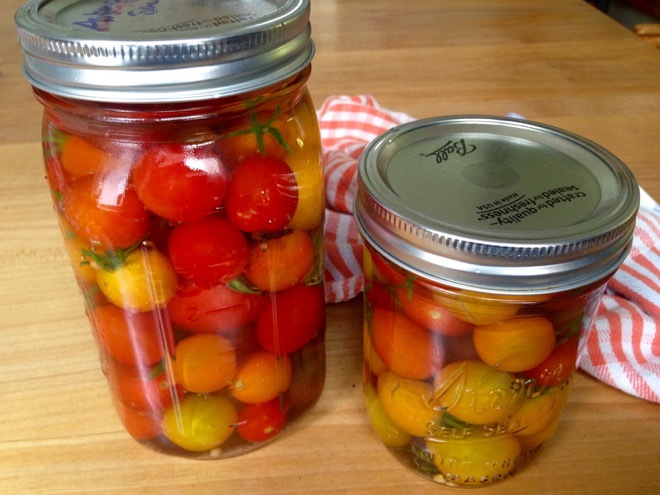 I just put up these jars of cherry tomatoes in vinegar with tarragon, white pepper, coriander and cloves. I will report in six weeks, when they are supposed to be ready to try, though they will keep for many months. A few weeks ago I started a half-gallon jar of lactic-fermented pickling cucumbers upon which I’ll report as well. The recipes I’ve perused, all contributed by farmers and cooks in France and Belgium, are easy to follow but a bit vague. If you’re comfortable in the kitchen and don’t mind thinking a long and using your own judgement occasionally I think you’ll find it useful. 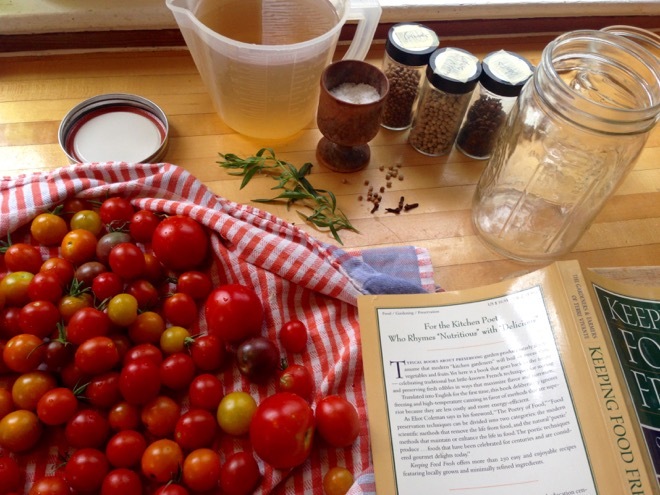 I’m eager to try many more recipes, including lacto-fermented tomato sauce, long-cooked jams, tomatoes preserved in salt and oil, etc. Prick each tomato 2-3 times with a thin sewing needle. Gently pack the tomatoes in the jars adding the tarragon and spices here and there. Finish with a bit of salt and pour vinegar over to cover. Screw on lids and store in a cool, dark place. After six weeks they will be ready to eat. They are supposedly excellent with hot or cold poached fish, grain dishes and rich terrines. Can’t Keep Up with the Cucumbers? !